This is one of them products that has just lived on my wish list for such a long time. I feel like this is one of them classic cult beauty products, I literally feel like I am the only person in the world who didn’t have this in their collection. I didn’t think that there would be an issue with the quality of this Benefit Hoola Bronzer, because it must be good for it to be so popular all of this time later, the thing that worried me was the shade. Having quite deep tanned skin, I just didn’t think it would work for me, I have swatched this before and in the pan, it looked more like a face powder to me! I then went out and was doing a touch of shopping around Boots and I finally just bit the bullet and went ahead and bought it. I have watched so much on YouTube and read so many reviews on this Benefit Bronzer that I was pretty much already in love with it. I was so giddy when I first bought it and having to wait until I could do my photography with it looking pristine, almost killed me because I wanted to jump into using it straight away. I will admit that I used a small amount from one of the corners to nose contour because I just couldn’t wait! 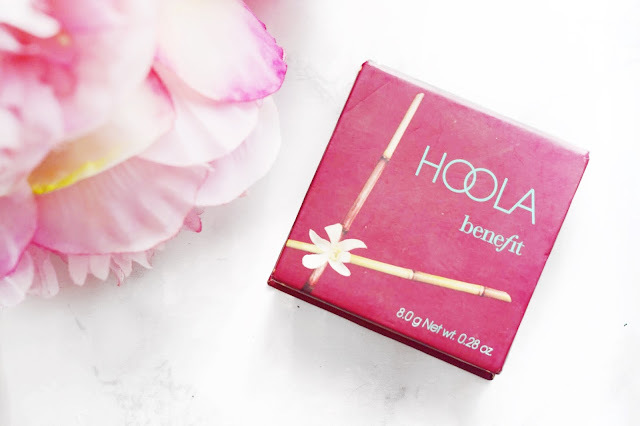 First up with this Benefit Hoola Bronzer is that the packaging is just too cute. 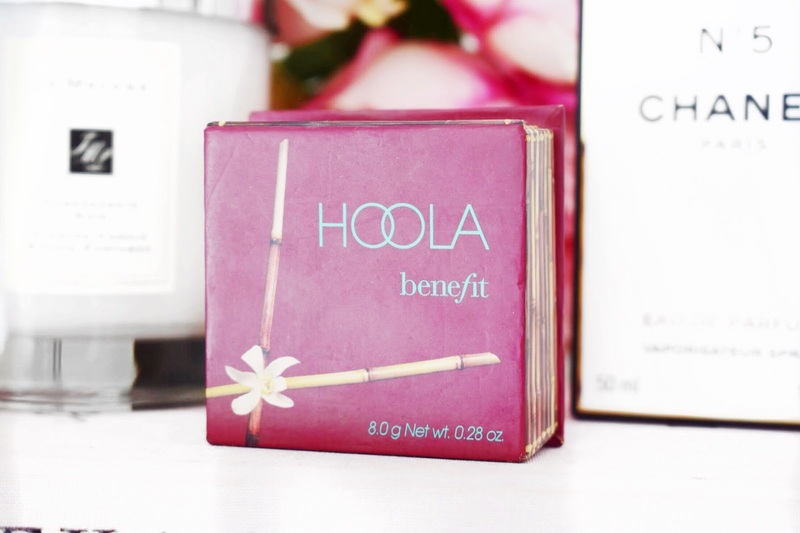 I thought that the cardboard packaging would bother me, but I think it is that whole aesthetic of the Benefit Hoola range the bamboo edging just suits the product so perfectly. I will say that it is a little chunky so it isn’t that great for travelling with and I am still yet to see how it holds up when it is thrown in my makeup bag when I go on holiday, because I really wouldn’t want the cardboard packaging to get squashed and it ruin the product. I guess the chunky packaging is so that they can fit in the small brush that you get with it. Moving onto that fact, you do get a small brush with it. The brush in this Benefit Hoola Bronzer reminded me of a much smaller version of the Nars Ita Brush that I love. It just has a thin edge which is perfect for contouring with because it can really chisel out the cheekbones and get in the hallow of the cheek. Personally, that brush just isn’t for me, even though I love the brush itself and it does work really well, I have my Nars Ita brush and I just don’t feel a need to have them both. Plus, this one with it being so small will just get lost in amongst my other brushes and end up being lost forever. I don’t think I will bin it, it will probably just go away with all of the packaging that I hoard! Now onto the actual product itself. The first thing that I am going to mention about this Benefit Hoola is the colour of the bronzer. This was the thing that concerned me and stopped me from buying it years ago. For me, the colour of this doesn’t suit my skin to bronze with, it just isn’t bronze and glowing enough for what I like, but for contouring this is just the perfect colour. I take this on my MAC 190 or Real Techniques Contour Brush and it looks so stunning. It has the most perfect undertones for contouring with, it has a grey and ashy tone, which isn’t too intense, and the colouring for my skin is just like a match made in heaven. I will say for the winter months when I am a little less tanned, this will be perfect for bronzing with. The final thing that I want to touch on with this amazing Benefit Bronzer is just how blendable it is. I have been known on an occasion or two to go in a little heavy with the bronzer. When I do this with this product, it just blends away like a dream and I don’t have to worry about looking like a choppy mess. I can pair this with pretty much any brush that I have and it will always come out looking really nice and well-polished. Even when I contour with this and I pack it on a little too heavy, with a brush like the MAC 187 it just blends it out so easily and that is all thanks to the high-quality Benefit powder and its creamy formula! 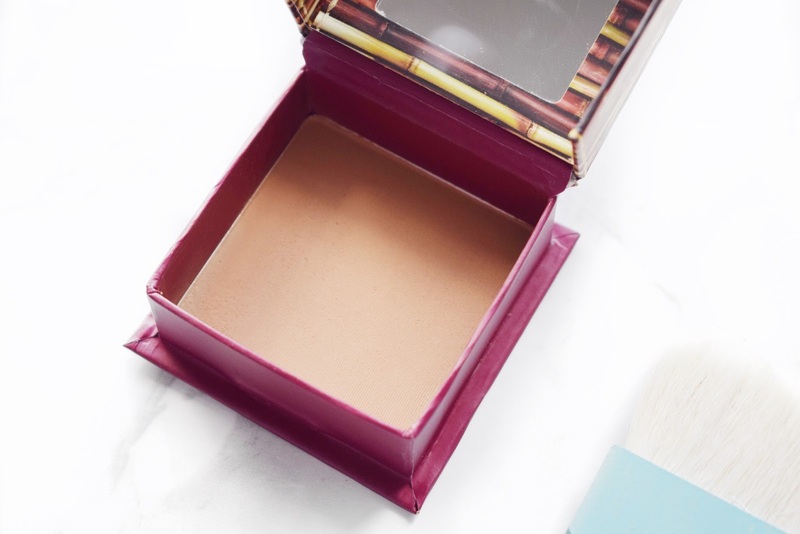 As you can see from this post, I am pretty in love with this Benefit Hoola Bronzer and I can see that this is going to be a staple in my collection for a very long time, just like it is with most of you guys. Anyway, I will link to this product down below in case any of you want to check it out. If any of you have tried this, leave me a comment down below and let me know what you think about it! It is such a great bronzer! I take it through the crease, it gives such a nice and natural shadow! I wish they did a deep version because when I'm really tanned, this is too light for me! It is a great bronzer, I use it every single day! It was the perfect shade for me and I'm a medium/tanned skin tone! I think the packaging is quite cute but not great for travelling with, it would be much easier with a plastic compact!